The brother directing duo of Joe Russo and Anthony Russo are currently very busy making the next two Avengers movies for Marvel, but they have already lined up their next project. Instead of tackling another massive movie franchise they are going to be returning to the world of TV. Though, they are sticking to comic book adaptations. This time they are adapting Quantum and Woody from the world of Valiant Comics. 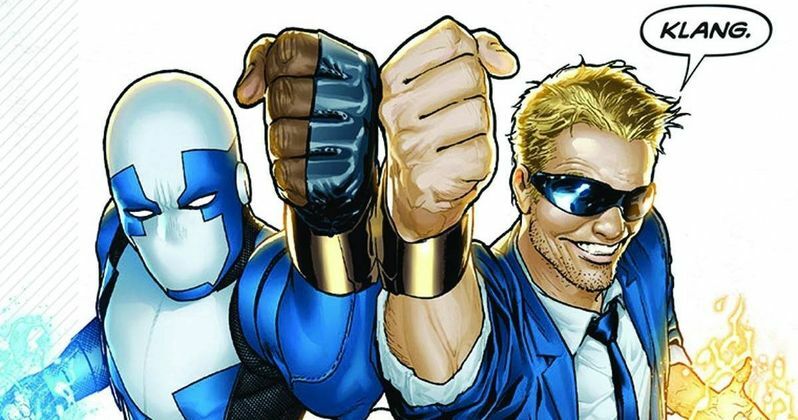 The report comes courtesy of The Wrap who are reporting that this Quantum and Woody TV series will be the Russo brothers' first project after they wrap on Avengers: Infinity War and Avengers 4. Before directing Captain America: The Winter Soldier, Joe Russo and Anthony Russo cut their teeth in the world of TV, specifically comedic TV, with shows like Arrested Development and Community. Given that Quantum and Woody has something of a light tone and that they are billed as the world's worst super-duo, this seems to be right in their wheelhouse. For those who may not be familiar, here is a synopsis of the Quantum and Woody comic book series from Valiant Comics. "Once upon a time, Eric and Woody Henderson were inseparable. Adopted brothers. Best friends. Brilliant minds. Years later, they are estranged siblings, petty rivals, and washed-up failures. But when their father's murder leads them into the throes of a life-altering scientific accident, Eric and Woody will find themselves with a whole new purpose, and a perfectly legitimate reason to wear costumes and fight crime. Go big or go home, folks! Quantum and Woody are coming! (And, yes, there will be a goat too. Eventually." The Russo brothers will serve as Executive Producers on Quantum and Woody alongside Mike Larocca and Valiant Entertainment's Dinesh Shamdasani. Some more Marvel Studios alum are involved in the project as well, with Andrew Barrer and Gabriel Ferrari, who are currently writing Ant-Man and the Wasp, scripting the pilot for the new series in addition to serving as Executive Producers. Quantum and Woody may not be a household name, but with this creative team in place, it would be hard to not at least be a little interested in this show. There are quite a few Valiant Comics projects in the works right now. Sony Pictures is currently working on movies based on the titles Bloodshot and Harbinger, which were both written by Oscar-nominated Arrival screenwriter Eric Heisserer. Archer & Armstrong and Shadowman are also both currently in development as movies. We could be seeing some sort of Valiant Cinematic Universe in the near future if this trend continues. Joe Russo and Anthony Russo are Emmy-winning directors and they have done tremendous work in the realm of comic book adaptations. There is no reason to think Quantum and Woody won't also be great. Also, considering that this is the project they have decided to do right after the next two Avengers movies, that should inspire some confidence. There is no network attached yet but we should be hearing more about the project in the coming months.